Your feedback is valuable to us. 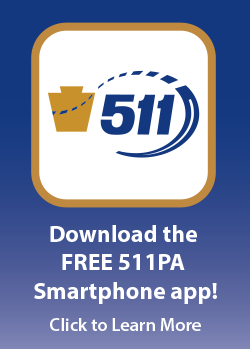 Please help us improve 511PA by completing this form below. Please complete this CAPTCHA verification. This helps us reduce SPAM submissions. Note: If you are using the audio CAPTCHA verification option, press "SPACE" to begin audio playback; press "R" to replay audio CAPTCHA; type in the numbers you hear and press the "Enter" key when done.